click image for close-up Although sporadic fighting continued for two years afterwards, the 1781 surrender of Cornwallis at Yorktown, Virginia signaled the defeat of the British army in the Revolutionary War. 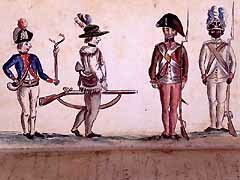 Shortly after the Yorktown campaign, a young French sublieutenant named Jean-Baptiste-Antoine DeVerger sketched a watercolor image of four foot-soldiers in his notebook. DeVerger's depiction demonstrated the eclectic composition of the patriot army and the alliances forged in order to create it. One of the men is dressed in a fringed shirt, a hatchet in his belt and a flintlock in his hand. Three of the four wear military dress, including the gold-braided uniforms of the French and the blue and buff worn by Patriot officers and a few of the foot soldiers. One of the uniformed soldiers is black, a light infantryman of the first Rhode Island Regiment.